On December 29, 2011 Schuyler Hose Co. placed its new tanker in full service. TA-574 is a 2011 E-One Water Master Vacuum Tanker on an International 7400 chassis with seating for a crew of two. The tanker is equipped with a 1250 gpm Hale Pump, a Vacuum Pump and 3500 gallon aluminum water tank. 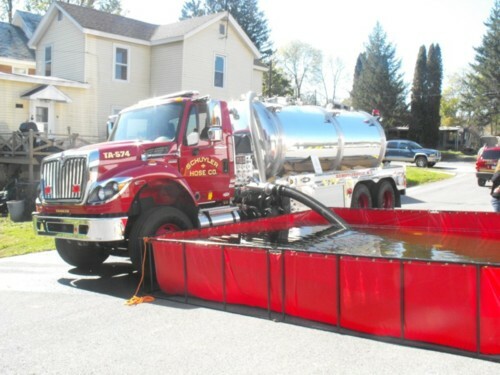 Water Master vacuum tankers can be filled at up to 2000 gallons per minute without a Class A Engine at the fill site using its unique self-filling vacuum system The tanker can self-fill from up to three suction inlets using almost any alternative water source including ponds, rivers, lakes, ditches and swimming pools.